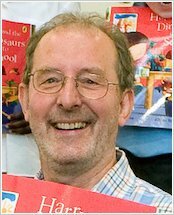 Ian Whybrow is the best-selling author of over 100 children’s books, and is best known for his much-loved Harry and the Bucketful of Dinosaurs books. He is now published in 27 languages in 28 countries! Before he took up writing full time, Ian spent most of his working life in secondary education, mostly as Head of English and Drama and later as Head of Sixth Form. Apart from his wife and daughters, his passions – in no particular order – are: Herefordshire, where he retreats to write in a deeply rural Victorian villa; digging; walking with friends; swimming; cycling (especially in France); the poet Stevie Smith; the theatre; books, films and hedgehogs. Harry and the Dinosaurs: The Snow Smashers! The imaginative, heartwarming stories of a little boy who does everything with his best friends – a troupe of plastic dinosaurs! – have become much-loved modern classics. A series of vigorous, rollicking stories specially created to appeal to boys, or to anyone at all who likes a furious, fast-paced read. Just be warned: they’re not for the faint-hearted! I was born in Gillingham, Kent but I’m not telling you when. Great Expectations was the first great book I ever read, so it made a deep impression. On the Waterfront. No screen actor has ever given a better performance than Marlon Brando does in that film. A carved box made from a piece of wood from Shakespeare’s birthplace in Stratford given to me by Mrs Penny next door when I was ten. She paid me a great compliment: “There you are. You like Shakespeare, I expect.” I’d never (consciously) read a word at the time, but I thought it was very nice of her to think that I might one day. The immediate inspiration for The Sniff Stories was The Secret Diary of Adrian Mole, by Sue Townsend (1st person narrative, fish-finger sized chapters, English, funny, domestic). Other influences were JD Salinger (for his voices and for the way he can convey natural, spoken language); Stevie Smith, GM Hopkins, Dylan Thomas (all for their oddness, their pleasure in finding new ways of using words and in the sounds of words and voices), John Burningham, Maurice Sendak and Helen Oxenbury (for their picture books that I was happy to read over and over again with my children); AA Milne, Kipling’s Jungle Book, and Alice in Wonderland for their warmth, peculiarity, humour and rhythm. Herefordshire – it’s beautiful and tranquil and as yet undiscovered. Shhhhh. What would you have been if you weren’t an author? Reproduced with thanks to Puffin Books.